Jack PalazziJack Palazzi is a writer for the Mountain Lakes Alumni Association. He currently attends Providence College where he will graduate in May of 2019 with a bachelor's degree in finance. Jack grew up in Mountain Lakes where he attended school from Kindergarten through 12th grade. At Mountain Lakes High School, he served as class president his junior and senior years, and simultaneously co-captained the track team and an undefeated State Championship football team in 2014. Jack's interests include spending time with family and friends, as well as sports, film, politics and history. He currently resides in Mountain Lakes along with his parents Chris (MLHS '78) and Nancy ('82), and siblings Nick, Matt, and Kendall. 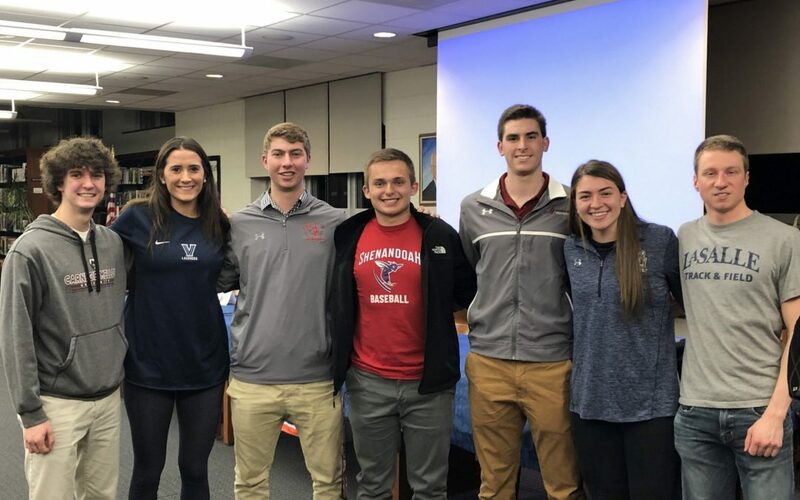 On Tuesday, January 8th, 2019 the Mountain Lakes Alumni Association, along with the MLHS Guidance and Athletic Departments, held an Alumni NCAA Panel to hear from Laker Alumni about their college sports experiences. The panelists talked about their high school sports careers, the college recruiting process, life as a college student athlete, and gave different advice on their sports journeys. Students and parents from the Mountain Lakes community had the opportunity to ask questions and meet with the alumni after the panel presentation. MLHS Alumni from left to right: Andrew Spoto, Class of 2018, Carnegie Melon track; Grainger Rosati, Class of 2016, Villanova lacrosse; Ben Kaplan, Class of 2018, Wesleyan lacrosse; Mike Verzaleno, Class of 2018, Shenandoah baseball; Danny Allison, Class of 2016, Muhlenberg football, Alyssa Sobesto Class of 2015, Old Dominion lacrosse; Steve Lewandowski, Class of 2012, La Salle track.